Secret Life of a Mother at the Theatre Centre is a stunning exploration of the raw, invisible, and gritty realities of two women’s experiences of parenthood. 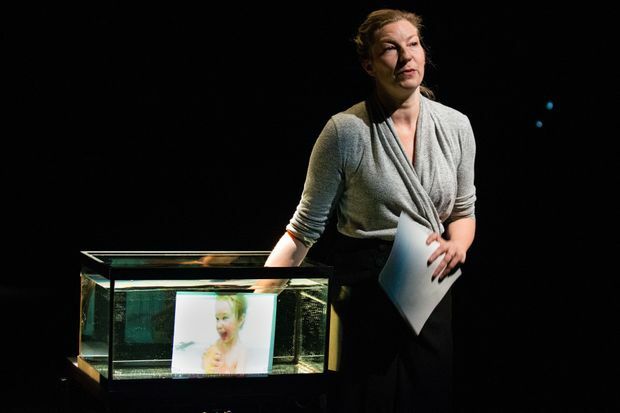 Created by Hannah Moscovitch, Maev Beaty, Ann-Marie Kerr, and Marinda de Beer, the narrative centres on Moscovitch’s early experiences with motherhood, performed as a solo show by Beaty. The arc spans miscarriage to parenting a young child, interspersed with Beaty’s own experiences in which she breaks character and speaks directly to the audience. Their real-life friendship is part of the story, so the shifts are organic, as though the audience is having dinner with both women and each interjecting her own story to validate and augment the other’s. The content is confessional, rooted in specific, personal experiences, but the larger significance shouldn’t be underestimated. Their aim is to reveal a glimpse of the underbelly of motherhood, the kinds of things women don’t feel comfortable sharing due to narrow cultural ideals of motherhood. To gestate life, we are told, is a beautiful irreplaceable experience that is meant to nourish and fulfill you, and yet is an intense bodily process over which you almost no control. It fundamentally changes your life, and in some respects, you. But what do you do with the parts of you that don’t change? What do you do when you feel alienated instead of fulfilled? What do you do when you want to keep working, despite its detractions from your parental responsibilities? Beaty is known for her compelling performances, but this show lays bare her ability to perform for a crowd of hundreds while giving you the impression she is speaking to each of us personally. Her shifts between portraying Moscovitch and speaking as herself, for example, are explicit but not clumsy. I had initial reservations about Beaty’s show-and-tell approach to her slideshow, but it ultimately feels well-suited to the tone of the production. My only criticism is that I suspect those at the back of the theatre might appreciate larger screens. Camellia Koo’s set is sparse but effective, consisting of a chair, a small water tank and a large one. The tanks facilitate occasional projections (designed by Cameron Davis), while embodying the central tension in the play as they alternately evoke wombs and cages. Secret Life of a Mother is both a refreshingly honest account of motherhood, and a strikingly sophisticated piece of theatre. Regardless of your parental status, you won’t want to miss this show.